Good morning! I have a new-to-me brand to introduce today. 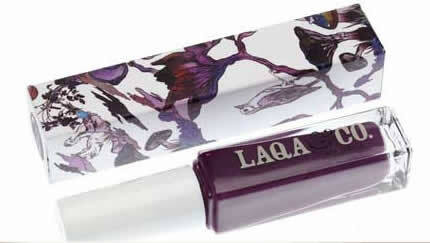 LAQA & Co. is a New York-based cosmetics company that offers Fat Lip Pencils, Nail Polish and Nail Polish Pens. But their products offer something a little extra too! Each package is covered in unique artwork created by young artists. The artists get their work seen by a wider audience...plus, they get a cut of the profit. As a former art major who almost chose a career as a starving artist, I think this a very cool concept! So first let me show you a swatch and then give you details of their new Color of the Month Club! I'm going to make a bold statement here...the formula was...gasp...Dior-like. Yup. I'm serious. You know I wouldn't say that lightly! Now this is the only one I've tried, so it's hard to say whether or not the entire line is this good. But for certain, Bells & Whistles had an ultra-smooth, creamy finish that self-leveled and stayed exactly where I put it! The tall thin bottle has a small brush and a very long brush stem. It takes some getting used to; but the formula was so nice that I had zero issues with application! Legit and Nemesis, two brand spankin' new shades, were just released for Fall. 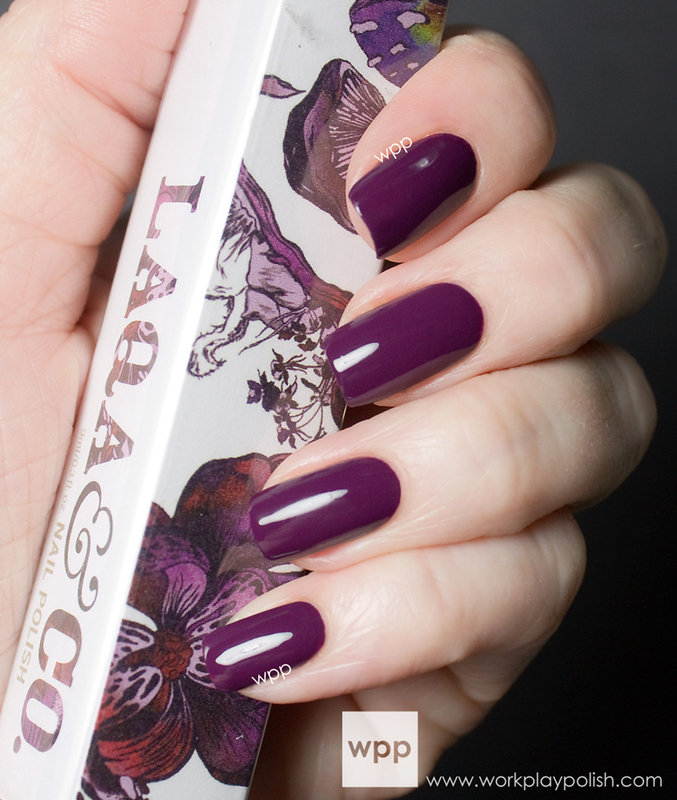 LAQA & Co. is launching a brand new Color of the Month Club! For only $10 a month, you'll receive a bottle of nail polish, their nifty remover pads and an exclusive fashion card in a hot gold envelope (an $18 value). And you can cancel anytime. The Club launches on October 1st, so keep checking the LAQA & Co. website and facebook for details. 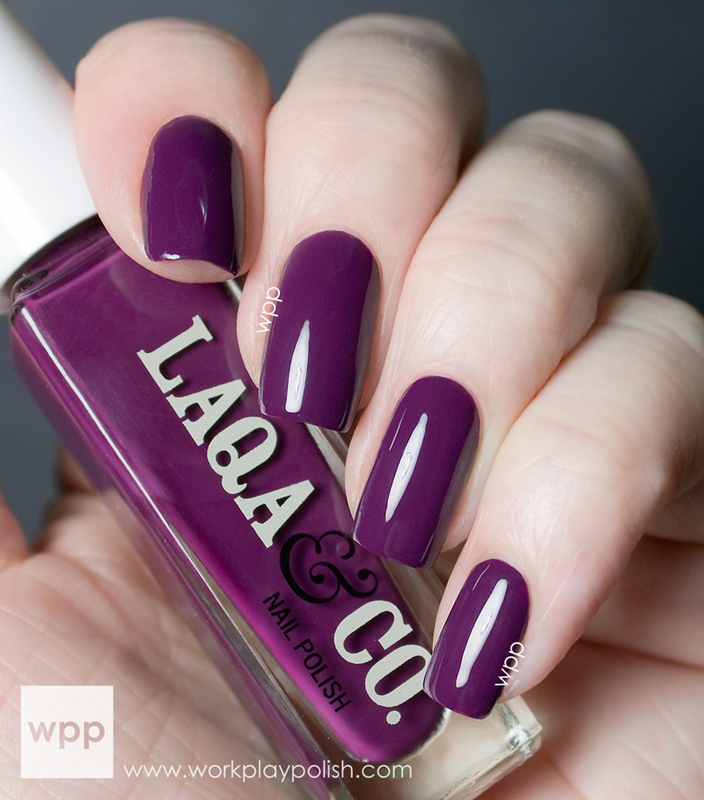 Each LAQA & Co. nail polish is 3-free. Their 11ml bottles retail for $11. They also offer handy Nail Polish Pens which deliver the polish directly through the brush ($14 - $15.95). You can purchase LAQA & Co. products online or through their many stockists (click here for a listing). For the latest news and promotions, follow them on facebook and twitter too.